Tucked into isolated pockets of the Uintah Basin’s arid wildlands is the best little plant you’ve never heard of. 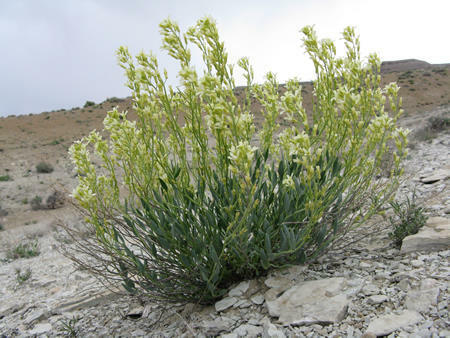 Known to exist only in Duchesne and Uintah Counties, Shrubby-reed Mustard seems to occupy only the semi-barren “islands” of white shale in areas of the Green River Formation’s Evacuation Creek region. The endangered plant features thick, almost succulent, blue-green leaves and small yellow flowers. Among the first plants to flower in spring, the perennial herb is visited by large number of insects, including many native bee species that forage for pollen. Scientists believe these bees may be critical in the plant’s reproduction and survival. Lewis says the plant, also known as Toad-Flax Cress and Uintah Basin Waxfruit, offers an understated beauty to the stark landscape. With a shrub-like form and multiple stems, Shrubby-reed Mustard grows to about 20 centimeters in height. Its leaves, which feel almost like leather, change to a bright purple in the fall. Despite its fragile status, Shrubby-reed Mustard is a long-lived plant. USU ecologist Geno Schupp says some individual plants may be one hundred years old. The elusive species has outlived scientists’ attempts to classify it and has undergone several taxonomic changes. It currently boasts the scientific name Hesperidanthus suffrutescens, placing it solidly in the mustard family. Lewis knows of no history of Shrubby-reed Mustard as a culinary or medicinal herb, though documented reports of such uses for mustard plants date back to ancient times. The plant appears to provide welcome forage for some four-legged creatures, he says, as he recently witnessed plants that had been grazed completely and ripped from the ground.